I closed the doors to my Advertising/Design business in 2010 to begin painting full-time. Life as a painter is a blessing—and a challenge. I spend my days teaching classes and workshops in the US and abroad, as well as participating in outdoor art shows, entering exhibitions, judging shows, marketing myself, attempting to keep up with technology,—and painting. I’m grateful to have a loving spouse that understands my passion. Whatever my subject, I attempt to paint it with a calculated mix of detail and looseness developed through years of practice. Capturing light, transparency, and contrast are my primary goals. I am honored that my paintings have won top awards and have been featured in national publications and books. I’m diligently focused on continuing to grow as an artist as well as a creative, caring human being. 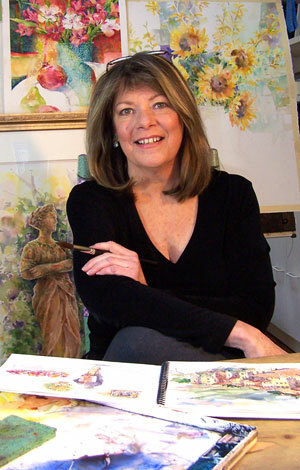 Featured artist: Staunton Augusta Arts Center, Staunton, VA.